Pearl Izumi's Elite Barrier Shoe Cover is back with all new paneling, rear closure, and Kevlar® bottom providing excellent warmth and superior weather protection. The 3mm neoprene construction is fleece lined to keep in warmth and keep out the elements. Two stage hook and loop closure provides both sleek fit and easy on and off, and anatomic paneling delivers a performance fit. For the underside, a Kevlar® reinforced road cleat cutout spreads open for easy on and off while providing superior durability. Recommended for road shoes with external cleats. White with Reflective elements for low–light visibility. Keeps your feet warm and toasty! As read from Road Bike Rider weekly newsletter, "they perform better in cold and wet conditions and do it for a reasonable price." Most all neoprene shoe covers will eventually let moisture seep in, whether it is at the cuff or at the cleat opening, but a great bootie will still keep your feet warm, even down to the teens. This is a great bootie. 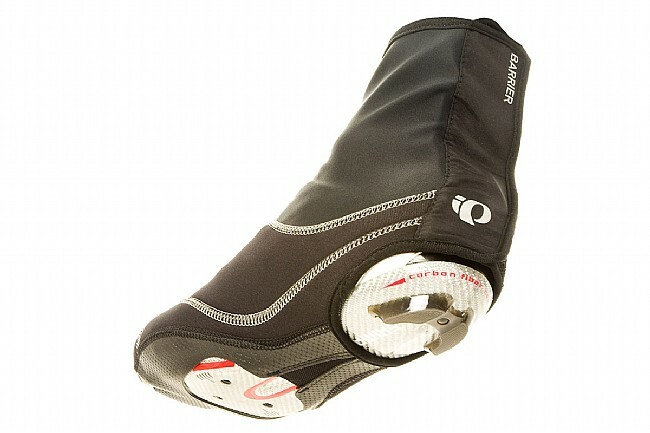 I use toe covers down to 25-30F but if it is colder and I have to ride longer I switch to the full cover. I was able to ride around 3 hrs in 15-17F weather in this. My toes still got cold but not numb or painful. This is a good deep winter cover. Beware of fit. Sizes run very small. 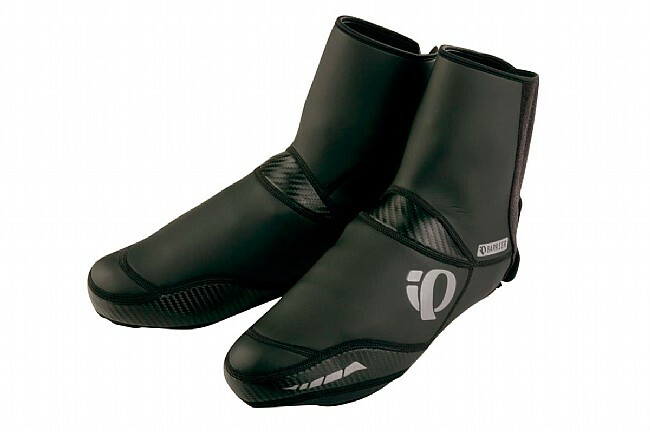 I didn't have a chance to try these yet since the Large doesn't even come close to fitting a size 10 Sidi winter boot. Judging from the material, it is rather thin for a barrier cover that should keep toes warm. We'll see after I pay to return them. Easy to get on and off. Seemed to run a little small. I bought the white (because it was $20 less than the black), and although it is a huge fashion no-no to wear white before Memorial Day, I wear these in the winter. So far, so good, haven't had a really cold ride (below 30F) with them but they seem to do the job as well as any other neoprene booties. I like the tougher soles and toes, these always got torn up on other ones, additionally the velcro closure in back is a whole lot easier than a crank-scratching zipper. Great reflective tape usage, these are super visable which is important on a rotating part of the bike to get the sleepy drivers attention. Only negative (which doesn't matter to me for commutingtraining) is that they are not very aerodynamically smooth in the back, especially around the velcro closure area. Again, it is probably a watt or two which doesn't matter to me but if you are looking for a shoe-cover for a TT or racing you may want something different. Overall, five stars, and BTD is the best online bike store there is. Don't be afraid to buy the white. After a couple rides in the rain and mud they'll be black anyway! Provides great protection and warmth for days less than 40 degrees. Easy to slip on. Should have bought sooner instead of wearing multiple socks and plastic bags. I expected something warm and dry for our Seattle weather, but I return from my 2-3 hour rides with cold, very wet feet. With the name Barrier, I was surprised by the results. Now, if it is not raining, these are very nice, but add a little wet stuff and my feet go south very quickly. My shoes are 41 EU8.5 US and the medium size shoe covers are not large enough to wrap around the back of my foot. On the plus side they seem to be made pretty well - I just can't use them. I'll sell them cheap to somebody with a really small shoe size. These are great! They're well-made and they fit well. I ride to work in Minnesota winters and these keep my dogs warm and dry. I use a commuter-type shoe, which I then wear around my office, so it's nice to be able to put them on and take them off easily. For those that ride year round during New England winters these are just what the doctor ordered. They keep your feet warm and dry between 18F - 40F and are also durable. Above 45F I find these too warm and use a lighter set of booties or wear PI toe warmers. These are probably good below 18F, but I just haven't ridden in those temps. Be sure to size up! I wear 46 road and mountain bike shoes and XXL fits both just fine. Keeps my feet warm fro 20F to 45F. Rode at 20F with 20 mph wind. Get too hot above 45F. Got XXL size for my size 46 road and mountain shoes. Great Pearl Izumi quality, as you would expect. Fits exceptionally well, newly redesigned bottom panels are far sturdier and longer lastingwearing. Excellent cold and wet weather protection. Exceptional wind proofness. I wore out an earlier version of these over the course of 2 winters. Hard riding conditions, hike-a-bike through snow and muddy conditions. Eventually the elastic bands underneath gave out. This newly redesigned version uses extremely tough new material with far more coverage, better stitching, and reinforcements. I suspect I should be able to get at least 3 or 4 hard winters use out of them. Great shoe covers. I often find I'd prefer to wear my regular road or mtb shoes with these covers, over my Mavic winter boots. Very pleased with these booties. Not overly bulky but nice and warm. Will keep you dry in light rain for hour & half, but will get wet after about 45min of steady rain.